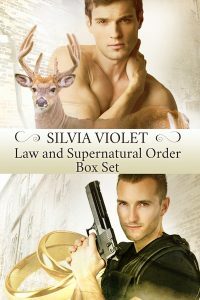 The Law and Supernatural Order Bundle contains four complete humorous shapeshifter novellas. Save 40% off the price of buying them individually. Deer shifter, Jason Fleetfoot, has turned his life around. After years of taking chances, he’s working as a crime lab technician, and he’s determined to forgo the risky behavior of his past. Then he meets Drew Danvers, the only undead detective in the city. Jason hates vampires, or does he? Drew defies all the stereotypes of his kind and something about him has taken hold of Jason and won’t let go. So Jason might dare to take a chance on a man others would label a risk to his health if not his very life. When a murder investigation at a shifter nightclub brings owner Brandon Lord and Lieutenant Seth Morrison together, passion roars to life. They’re both willing to break the rules to be together. Because as mismatched as they might seem, each man is exactly what the other needs. Deer shifter Jason Fleetfoot and vampire detective Drew Danvers have been together for a year. When Drew proposes, Jason is thrilled but shocked—vampires aren’t usually the marrying kind, even the few who side with the good guys.